Sometimes maintenance contracts are appropriate for effective pigeon control. Getting rid of pigeons is what we do every day. Eliminating pigeons is important to your health, safety, public image and peace of mind. Contact a professional pigeon removal specialist in your area. Pigeons, or rock doves, are sometimes referred to as "flying rats." They are similar to rats in that they are filthy, they spread disease, they are prolific, and they have adapted well to urban living. Pigeons are persistent birds, and once they find a location that they like, these creatures of habit will go to a lot of trouble to stay. They are also social creatures; rarely will you find one alone. 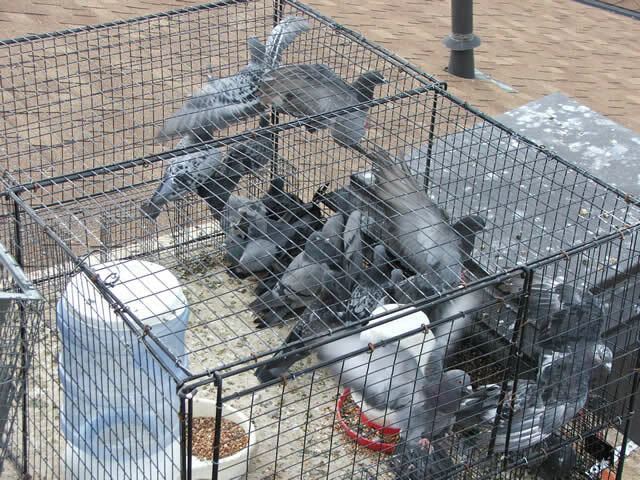 Pigeons become a problem when they take over areas inhabited by humans. They are not afraid of people and will approach repeatedly for handouts, which quickly grows tiresome. They defecate freely, leaving messes on sidewalks, buildings, cars, statues, and rooftops, and clogging roof drains and ventilation systems with feathers and feces. 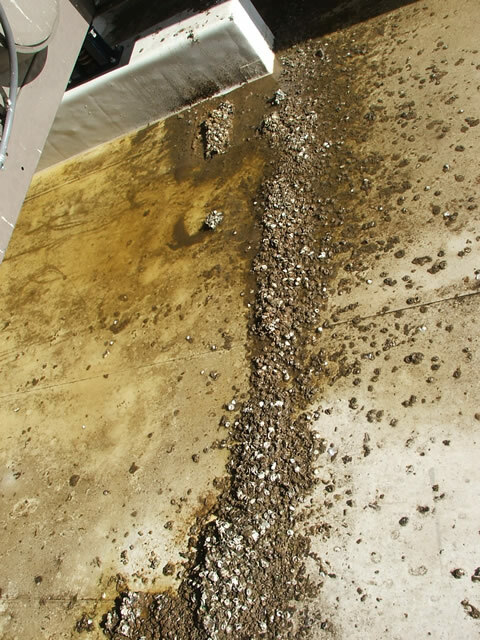 Not only are pigeon droppings and feathers unsightly, they also spread disease and parasites, such as fleas. I did a pest bird removal project for a local school with a long-standing pigeon problem; the main body of the infestation was located on the roof right by the air handlers. 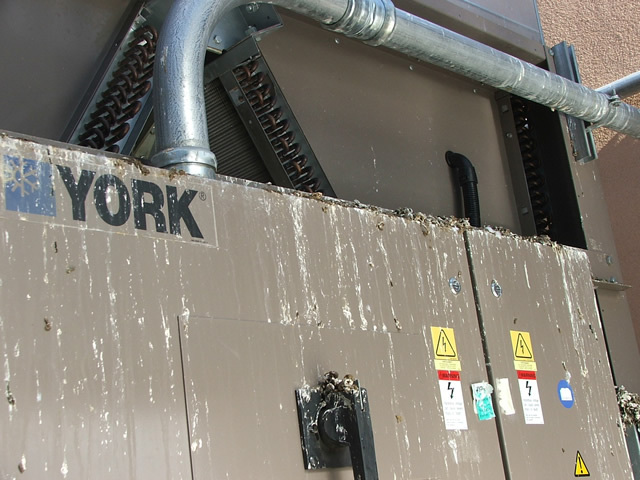 Smells and bacteria from the birds had been sucked through the ventilation system for a long time, yet school officials had let the problem go on because they thought there was nothing you could do to get rid of pigeons. I rid that school and many others of pest doves--my methods work! I have live-trapped hundreds and hundreds of pest birds; it is absolutely a solvable, manageable problem. For proper dove control, you need the right equipment. Sometimes people put up spikes or netting or a fake owl, thinking that will solve the problem. These methods cause only a minor inconvenience to pigeons; the birds will almost always find a way around them. It is similar to when a person gets locked out of his house-eventually he will find a way back in. When my technicians remove pigeons we use the right traps and proper bait. 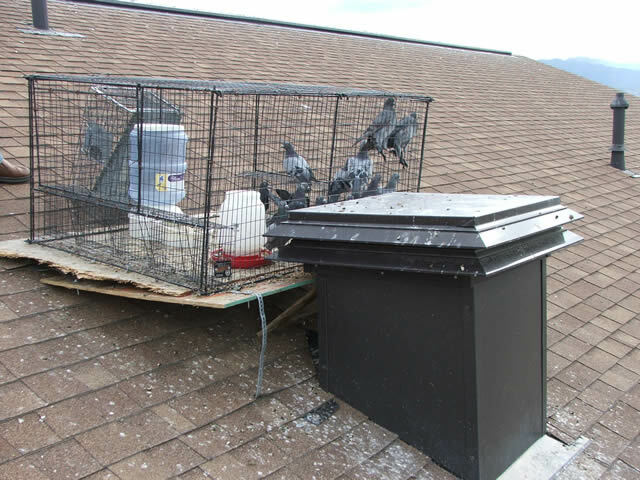 Complete pigeon trapping usually takes several weeks, and the procedure may need to be repeated a few times throughout the year. 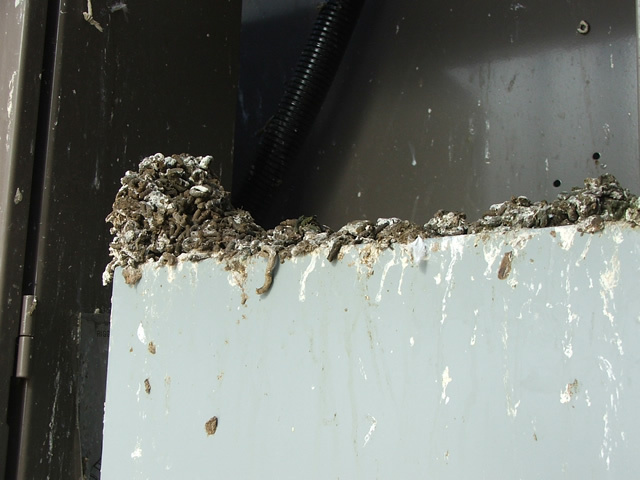 In some cases, we offer maintenance contracts to remove the birds on an ongoing basis, keeping their numbers to a manageable level. Don't put up with nuisance birds any longer! If you choose to ignore the doves or fail to take measures against them they will multiply and spread, damaging other buildings in the area. 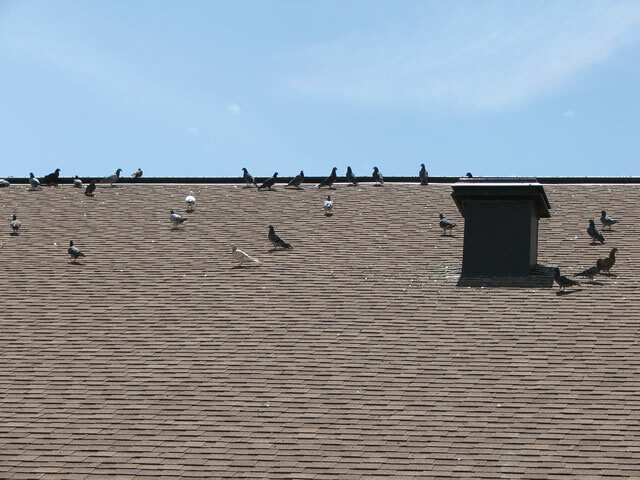 Rather than let the populations grow unchecked, neighboring home owners or business owners often choose to co-op in solving an area pigeon problem together. If the birds bother the community, sometimes everyone will pitch in toward a solution. Your inconsiderate neighbors who feed pigeons may not want to become involved in a pigeon solution; if this is the case, we can still help. My pest bird removal specialists are able to trap birds several hundred yards removed from the heart of the problem. For example, we received a request from a local businessman to trap and exterminate pigeons in his area. Employees of a neighboring business were feeding the birds, exacerbating the problem. 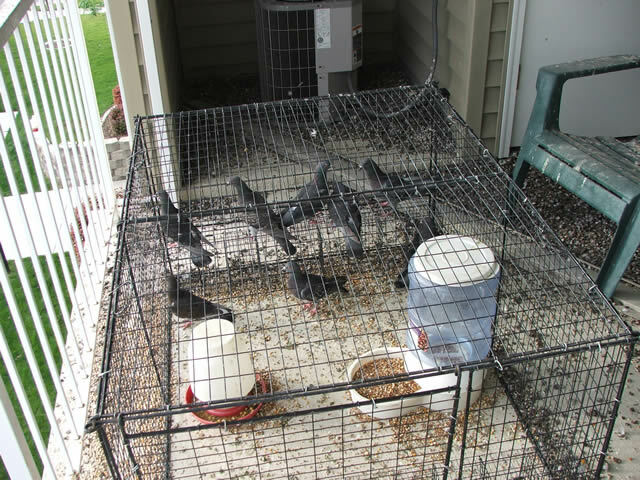 We were able to set our traps quietly and unobtrusively on his property, and within a few weeks the pest pigeons that were primarily on the other person's property were captured and removed. My technicians and I have removed seemingly countless pigeons from schools, universities, hospitals, churches, and large commercial properties such as Home Depot. Sometimes the pigeon populations in one location number several hundred. We prefer to do these large pigeon control projects-they are our specialty. However, we also do residential and small projects with less than 10 birds to trap. Not only do we trap and remove pest birds and animals, we can also provide professional clean-up and decontamination services. We use respirators and hazmat equipment while we clean up feces, feathers and dead pigeons to prevent inhalation of airborne diseases, and we have products to sanitize and deodorize affected areas. We also offer insect control services to exterminate any pests such as ticks or mites that almost always accompany pest birds. If you prefer to take care of the problem yourself, consider our coaching services. We will walk you through the steps to removing pigeons, and we can ship you the products you need to do the job right. We can also give you tips for pigeon prevention. Don't wait for your local Health Department to step in and take care of it-they won't. Call Allstate Pigeon Control today, or email us your digital pictures for a free phone consultation. To learn more, check out or Pigeon FAQ. For fastest service, call us at and schedule an inspection. We can take care of your problem. Our experts know how to get rid of pigeons. Pigeon removal is a systematic process. We can show you how to get rid of pigeons. 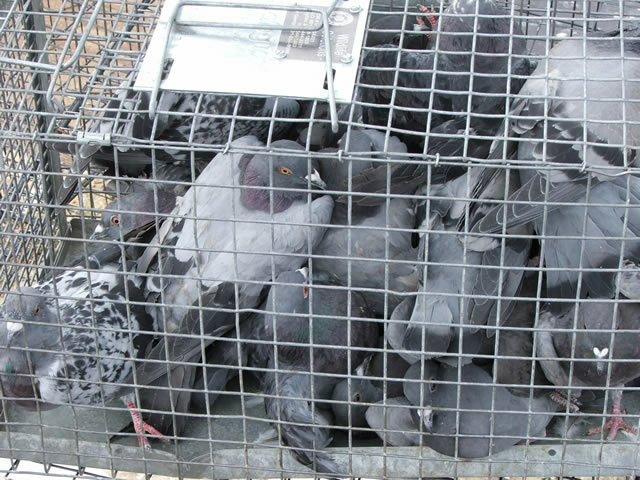 Trapping pigeons is usually the best method of pigeon control. We use humane methods of pigeon extermination. Pigeon problems are unsightly and unhealthy. 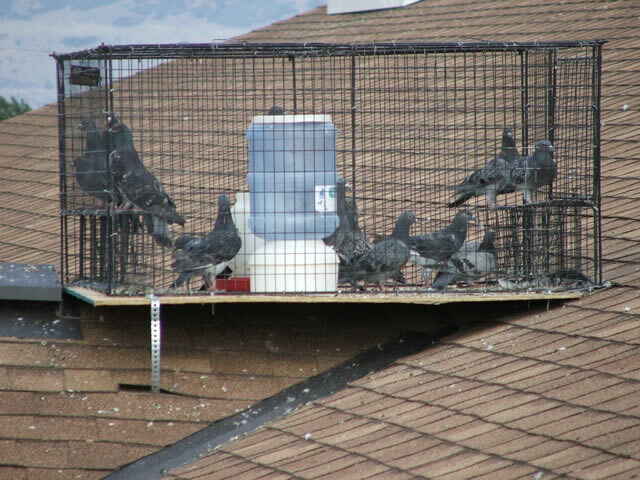 Pigeon prevention will help to prevent birds, feathers, and mess.